Howdy! I know it’s been a while, but I finally have the time and energy to sit and write again. I wanted to update y’all on something – I finally made a decision on my insulin pump. After weeks of research and countless back ‘n forth with insurance companies, my doctors, and the three companies I was courting, I came up with a decision. 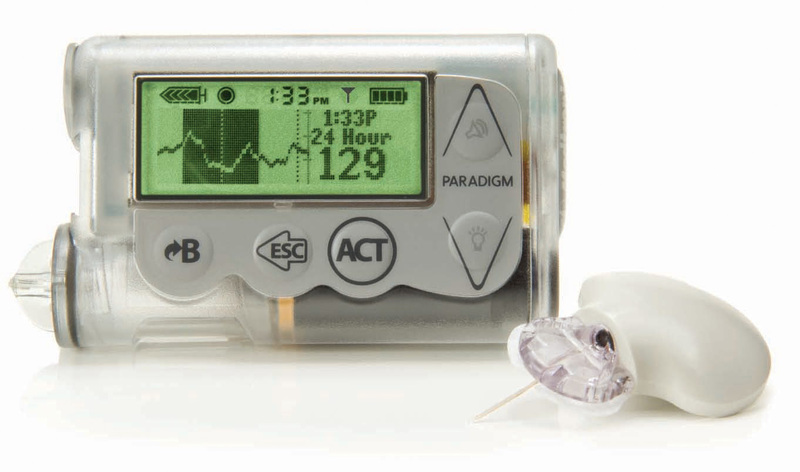 The Medtronic Revel. In purple, of course. So, why did I decide to stick with the Medtronic brand, even though I had the opportunity to leave them behind for something like The Ping (my next choice)? Funny story. I was all set to head over to Animas. I actually called to have them re-process my paperwork because the Rep I met with apparently never turned in my applications. (So… my personal info is somewhere out there in some guy’s file cabinet, yay?) I messaged my CDE for some reason and happened to mention that I was interested in the Ping. My doctor’s office is very Medtronic-buddy/buddy, so naturally she questioned my decision. I mentioned the perks of it being waterproof and I liked that it could give really small increments for basal rates, etc. and so forth and that’s what I needed the most, right? Smaller basal rates. Sort of. I also, apparently, needed the option to do half unit increments for carb ratios. The Revel can program that; The Ping cannot. (Yet.) So to further explore what my blood sugars would do if I were using a 1:4.5 carb ratio, I would need to either program my insulin manually or just get a Revel and be done with it. So I called Medtronic to place my upgrade order. THAT took way more time than it needed to and kept having to deal with “the rep handling your order is out of the office” crap. Whatever – just get me my dang pump. I think I called to follow up at least three times, which is normal protocol because they never fax the authorization requests to the right number. Ugh – red tape. So that’s my big announcement. I decided on an insulin pump. Yeah, I know that wasn’t nearly as exciting as you thought it was going to be, right. I’m sure you thought this would be a bigger deal than that… like I’d make some pregnancy announcement or something, huh? And if you know me in real life – please continue to keep quiet. And suddenly, “See Jen Dance” will take on a whole new meaning. Oh, girl…it only gets better and better! Did you see my post about the pregnancy diet I used? Honestly, the thing that kept me blood-sugar-sane throughout pregnancy was sticking to that. I was already a high insulin user, and was worried my insulin to carb ratio would go through the roof as the pregnancy went on, but really, it wasn’t as bad as I thought there near the end. Really, really, really great news. Congratulations! Also… hope you enjoy your new pump. I’ve only had the Revel (nearly four years now). No complaints. Extremely durable. Thank you! So far, so good. My team of doctors actually love how precise it can be. I think it’ll help later down the line for sure. I almost didn’t see your last note. I can’t wait to be able to ambush you publicly with glee and hugs at regular intervals. Hahah! Soon. 😛 Not now. WAY late to the conversation here, but CONGRATS!!! OK, two months late to the commenting game here, but…. a belated CONGRATS!! Always fun to start on a new pump no matter the type, so I hope it’s been treating you well so far. I was actually in the same boat at the start of the year — planned to go on the Tandem and was all ready to file paperwork with insurance, but had a chance of heart at last minute and went with the MedT Revel 723. Being a longtime MM pumper, this was the one that felt best for me over all the others, so I was really happy to get started on it in January., Will have to scan the past couple months of your posts to see what updates I’ve missed… (thanks to Scott for linking to this recently during D-Blog Week!). Thanks Mike for stopping by and wishing me well. 🙂 I’m doing much better than I was and I do like my new pump. I think, based on my current condition, that this was the best choice for me.